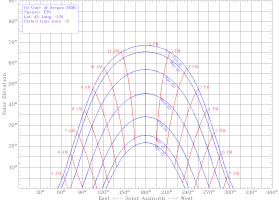 A very nice online tool that can be used to create sun elevation charts for your location. Engineering ToolBox, (2010). Sun Charts. [online] Available at: https://www.engineeringtoolbox.com/sun-solar-chart-d_1572.html [Accessed Day Mo. Year].